Bulk Player for YouTube is an online tools that let you play a list of YouTube videos continuously. After one video is done playing, the next one will be played automatically without your intervention. It is useful when you want to play a bunch of YouTube musics or watch a program in series from a distance -- e.g. you have a big display, or your computer is connected to a TV. Bulk Player for YouTube requires you to input the URL's of the videos in order to play them. You drag and drop the links into the input box. Sometimes you can find people post links of their videos on the web, and you can just copy and paste those links into the input box of Bulk Player for YouTube to play them. If you are using Google Chrome, you can install this convenient extension Bulk Player Mate to help you select and post YouTube videos to Bulk Player. Here is an example of how to use it. Step 1: Install Bulk Player Mate. After it is installed, you can see its icon in the toolbar. 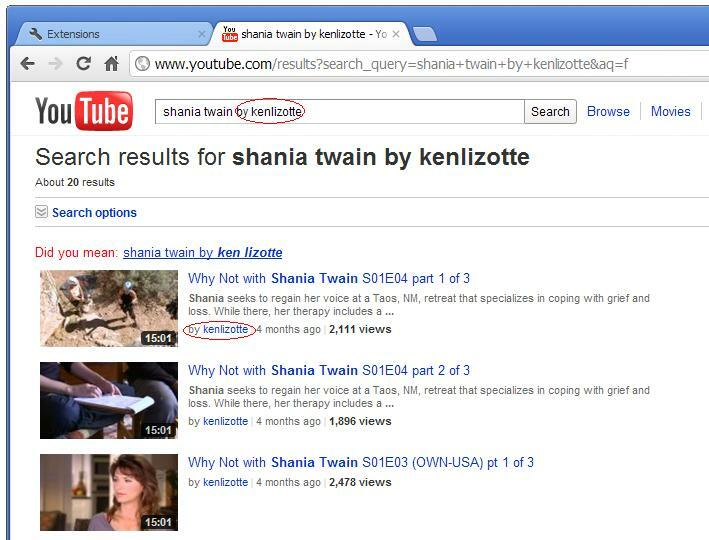 Step 2: Search videos on YouTube. 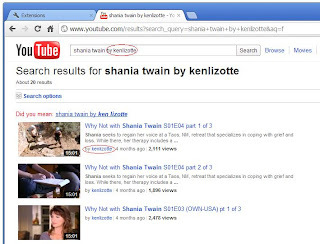 For example, if you want to watch some Shania Twain videos, input your search string "shania twain by kenlizotte" into the search box of youtube.com. You may notice the "by kenlizotte" at the end. That helps to narrow down the result to those by that submitter only. Step 3: Click on the Bulk Player Mate icon and the selection dialog pops up. Click on the checkbox of each video you want to play. Click on the OK button to play them. Your Google Chrome will open a new tab to load the online Bulk Player for YouTube web page and play these videos there. There are some helpful buttons on the selection dialog. The move-up and move-down buttons are used to change the orders of the selected videos. For example, if you want to watch the last four videos first, click the checkboxes of them, then click on the move-up button until they go all the way up. The Select All and Clear All buttons allow you to select all the videos or deselect all of them. On the upper side of the dialog, there is a "Select video links" drop down list. All videos found on the web page are divided into 3 groups: videos with text link, videos with image link and embedded videos. You can use this drop down list to view only one group. If you choose "all of the above", all the videos are shown, while duplicate videos from different groups are merged. To watch them in full screen mode, click on the YouTube video's full screen button. You only need to do it once. All the rest of the videos will continue to play in the full screen mode.